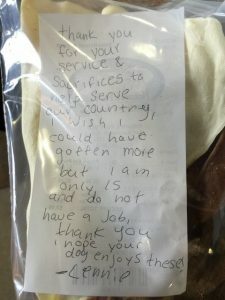 This touching letter to Cpl Singleton was left in a collection bin at Nature’s Pet Place in Hanover, PA. It was written by a teenager. Cpl Singleton has a service dog with several allergies. Roots for Boots is helping to offset the expense of the dog’s food by accepting both can and dry dog food donations at Nature’s Pet Place. We do not know who Lennie is, but we thank her for her support of Cpl Singleton and his service dog, Wanikee (Savior)!